Last month’s article on our trip to Utah, specifically, Bryce Canyon, has generated more buzz, or jazz, than any article in the Tips column so far. Thanks for the great feedback and support. I hope you get to make the trek someday. This month we pick up the trail from Bryce and head just a half-hour southeast to a much lesser known park, Kodachrome Basin State Park. And just in case you are wondering, yes, they have approval to call it that, which it well deserves. Most of that half-hour drive is seeing the Bryce Canyon from the bottom end and it’s a pleasant little jaunt. A friend back home who frequents this area put us onto it. Kodachrome Basin is home to more sandstone formations, but it has portions of harder rock. 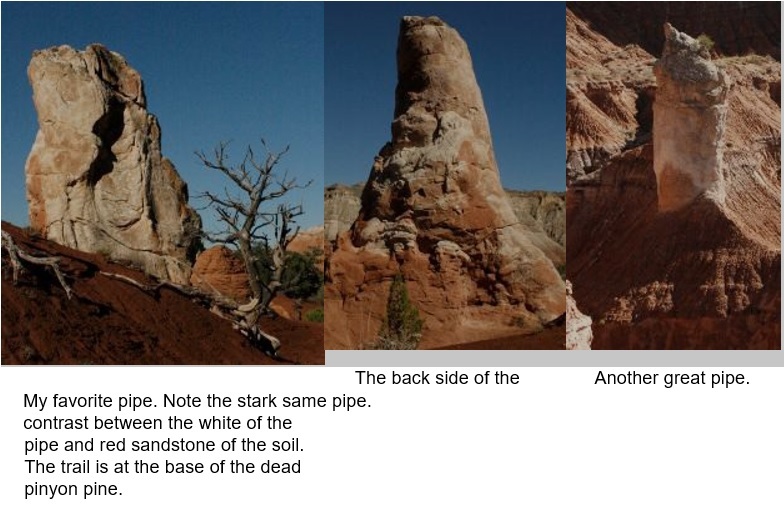 So not only do you get the hoodoos that occur in Bryce, but you get these formations they call pipes rising from the softer sandstone. They were usually white and cylindrical in nature. There are a full 70 of these pipes that rise up to 170 feet in the park and as stupendous as they were, my full attention, or at least 90% of it was on the trees. My wife Lisa said, you can’t take pictures of all of them, but ahhhh, I can try! But more about that in a minute. Since we were short on time for such a beautiful place, a quick glance at the map and we decided to take the Angels’ Palace Trail. This trail is only 1.5 miles long and 150 feet gain in elevation. There are several other very worthy trails in the park, but the choice of this one was serendipitous. From the parking lot we crossed the road and immediately forded a small stream and started picking our way through a very narrow but not too tall canyon. Visions of an ambush around each corner, ala Butch and Sundance, were dancing in my head. It had been raining the two days prior, during our visit to Bryce, but now the clouds had lifted and there was this very recognizable Utah blue to the sky. It’s very interesting how distinctive it was. Sort of like Oregon gray. The result was a bit of mud and muck on the trails to avoid. This type of sandstone, so typical in southern Utah, is called slickrock. When it’s wet, you easily find out how it got the name. In just a few minutes of scrambling we were out on top of the formation, with views of the surrounding park areas. By the way, we would have loved an all-wheel drive car on this trip. Our little rental sedan forced us to abort a trip to a second trail in the park due the muddy road. 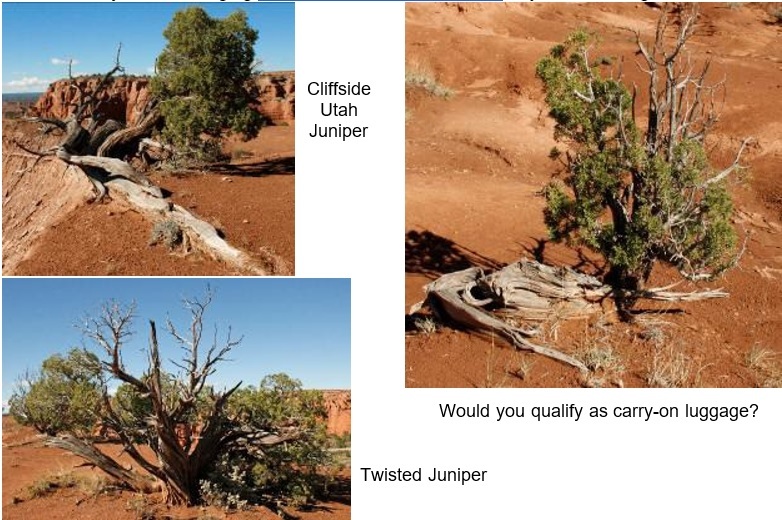 Out on top, I immediately began to spot gorgeous trunks of Pinyon Pine and Utah Juniper around every corner. The thing is, they were relatively small. A few were definitely in bonsai range, and the rest were larger, but less than 8 feet tall. They were in a size range that I could easily relate to bonsai. That’s when I went photo crazy. Snap here and snap there. I really could not turn around without seeing another, and another. I think the thing that struck me the most is how similar the trunks were on the two species. The same sort of warping and distressing had happened on either one. This whole area on top is a semi-level but irregular shaped plateau that you are free to explore. I walked out onto a narrow outcrop that was about a 100 foot drop down each side, on which Lisa refused to accompany me. In a later description she claimed it to be a mere two feet wide, but photos proved that it really was a very safe ten feet wide. I say very safe, but I was being very careful as I tiptoed out on the loose gravel. These days, I am very conservative myself. We were able to wander around about 45 minutes before heading down the same trail that we came up. A very quick and tasty trip with lots of sights. Minute for minute, the best bonsai inspiration of the whole trip. Next month, the last stop in the trip, Zion National Park.